tapas for appetizers because this time of year I’m always looking for a quick recipe for holiday parties. One of my favorite standbys is this date and cheese roll, a sweet twist on an old-fashioned cheese ball. 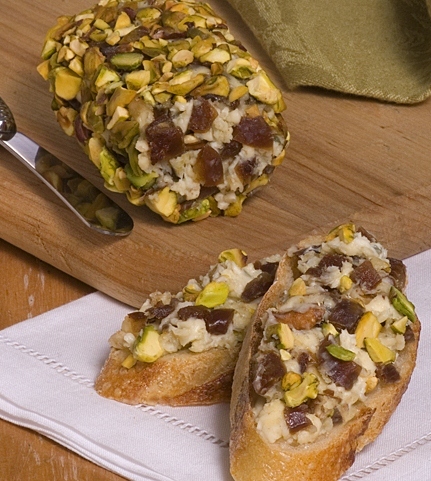 Chopped dates and triple cream blue cheese meld sweet and salt for an irresistible flavor at first bite. Serve room temperature on crisp crackers, or spread on toasted baguette, then pop under the broiler and serve warm. And if you’re still looking for another party nibble, here’s a vegetarian recipe developed by long- time colleague and Sunset Magazine editor, Linda Anusasananan. 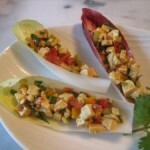 Endive with Tofu and Peanut Sauce. I brought it to a party last weekend to rave reviews! CHOP dates into approximately 1/4-inch pieces. Cut rind from cheese. COMBINE dates and cheese until well blended, using a fork or flexible spatula. Cover and chill until firm for easier handling. ROLL cheese into a ball or log. Spread chopped pecans onto a sheet of plastic wrap large enough to cover cheese. Place cheese on pecans and use plastic wrap to evenly press nuts onto cheese. Wrap and chill. Serve with crostini or crackers. Preheat oven to 400°F. Cut a baguette into 1/3-inch thick slices and place in single layer on a baking sheet. Bake 6-8 minutes until crisp. Can be made several hours ahead. If desired, spread crostini with cheese and place on a baking sheet. Broil 3-4 inches from heat, just until bubbly, 1-2 minutes. Serve warm. Recipe created by Rosie for Sun-Maid Growers; Photo styling and photography by Kelly Burgoyne. I love the combination of dates and blue cheese!!! We’re a nut-free household unfortunately – so could I just omit? Or do you have a substitution you could recommend? This would be a perfect appetizer over the holidays! You can certainly make this without the nuts, Susan. I hope you try it!